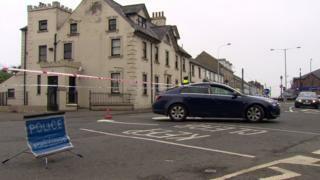 Police say they are not treating the death of a man at a hostel in Ballymena as suspicious following a post mortem examination. The body of the man in his 30s was discovered at the Simon Community hostel on Henry Street early on Sunday. In a statement the PSNI said it is awaiting "further results from examinations". It is understood they are investigating a drugs link to the man's death. An incident which took place outside the hostel is also being investigated by police. It is believed a knife was among a number of items taken away by officers for examination. A 27-year-old man was arrested on suspicion of robbery and assault occasioning actual bodily harm by detectives investigating the circumstances surrounding the sudden death. He has since been released on bail pending further inquiries. Rodney Quigley, a community worker from the Harryville Partnership Initiative, said people who live in the area have recently expressed concerns about the hostel. "Within Ballymena we need to address these issues. The people who open these hostels need to be serious about how they control them." A representative from the Simon Community was unavailable for interview, but in a statement the organisation said it was deeply saddened at the death of one of its clients. "The cause of death remains unknown and the charity is working with authorities on the matter," a spokesperson said. "Until clarification is received from the PSNI, it would not be possible to make further comment. Our thoughts are with the client's wider friend and family circle at this difficult time."